In this article you will learn about third-degree AV block, which may also be referred to as AV dissociation, complete heart block, AV block III, AV block 3 or simply 3rd degree AV block. Before reading this article, make sure that you have read the introduction to atrioventricular (AV) blocks. In third-degree AV block no atrial impulses are conducted to the ventricles. The atria and the ventricles are electrically dissociated from each other. This condition is referred to as atrioventricular (AV) dissociation. Importantly, for the ventricles to have any electrical (and thus pumping) activity at all, an escape rhythm must arise in an ectopic focus (located distal to the block). Third-degree AV block is a very serious condition because escape rhythms may (1) not occur, (2) occur transiently, or (3) occur but generate insufficient cardiac output. If no escape rhythm occurs, cardiac arrest will ensue. Third-degree AV block may be preceded by second-degree or (rarely) first-degree AV block. ECG examples are given in Figure 1. Figure 1. Third-degree AV block (complete heart block, AV dissociation). On the ECG P-waves have no relation to the QRS complexes. The QRS complexes may be normal or wide. P-waves have constant PP interval and ride straight through the strip, without any relation to QRS complexes. P-waves may occur on the ST-T segment (Figure 1, upper panel). The atrial rate is typically faster than the ventricular rate. It may be very difficult to establish a diagnosis of third-degree AV block if the atrial and ventricular rate is equal and the P-waves occur right before the QRS complexes. This – which is called isoarrhythmic AV block – may even simulate sinus rhythm. Third-degree AV block causes cardiac arrest unless an escape rhythm occurs. The escape rhythm may have narrow or wide QRS complexes, depending on from where the impulses are discharged and whether there is concomitant bundle branch block. 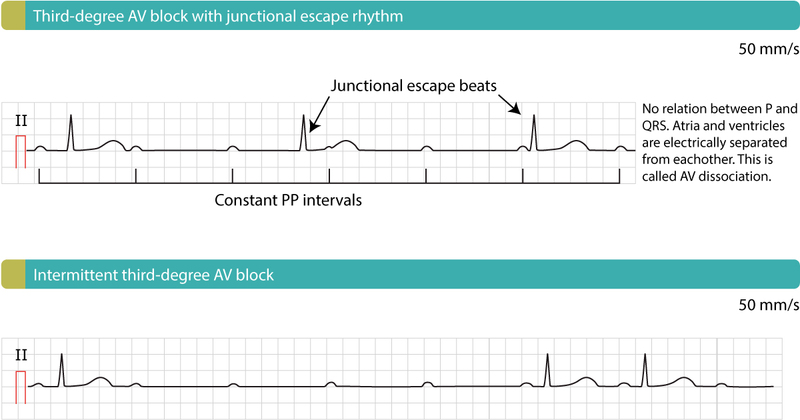 Escape rhythms with narrow QRS complexes indicate that the block and the ectopic focus (which generates the escape rhythm) are located proximal to the bifurcation of the His bundle. This rhythm is often referred to as junctional escape rhythm. Junctional escape rhythm is regular, with frequency around 40 beats per minute. If the escape rhythm has wide QRS complexes and frequency 20–40 it is most likely a ventricular escape rhythm. 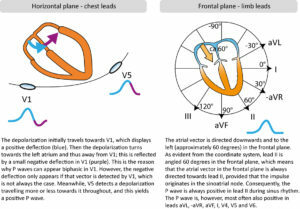 Ventricular escape rhythm is less trustworthy than junctional escape rhythm (because it may cease discharging impulses). Moreover, ventricular escape rhythm is slow and reduces cardiac output substantially. In case the distinction between second-degree AV block and third-degree AV block is difficult, the following rules may be helpful. Irregular ventricular rhythm suggests second-degree AV block because escape rhythms in third-degree AV block are regular. Regular ventricular rhythm with association between P and QRS and constant PR interval suggests second-degree AV block. Regular ventricular rhythm and varying PR interval suggests third-degree AV block, because atrial and ventricular rates are most often not equal (which makes the PR interval to appear as varying). Management of AV block 1, 2 and 3 is discussed in a separate article.